Uber-mountain man Sylvester Stallone matches muscles and wits with ultra-bad guy John Lithgow in this dizzying thrill spectacular. 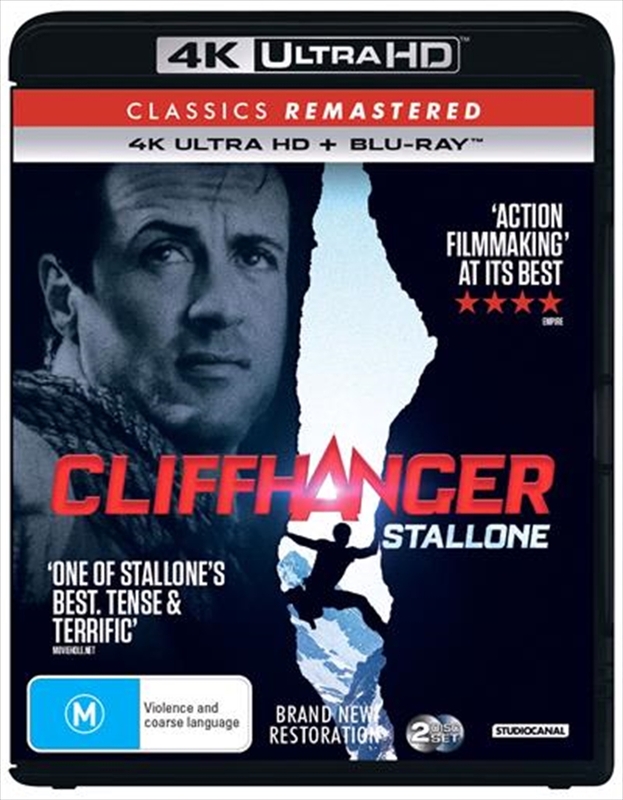 SYLVESTER STALLONE takes you to the edge and over it in this mountain of an action movie that scaled box office heights around the world to become a smash hit. John Lithgow (in a brilliant turn as ice-cold villain Eric Qualen), Michael Rooker (DAYS OF THUNDER) co-star in the high-altitude story of a Mountain Rescue team pitted against a gang of hijackers, who crash land a U.S. Treasury jet in the treacherous Rocky Mountains. Stomach-churning vistas and heart-thumping thrills make CLIFFHANGER a roller-coaster ride of a movie ... and one of the best action films you'll ever see!